Contact management is very important for academic work. We need to be in touch with prospective and current students, alumni, co-authors, competitors and peers. On top of that there are journal editors and publishers, funders, university administrators, and journalists. Social media multiply these connections and make it more difficult to listen and to be heard above all the noise. Yet, there are a lot of tools for effective capturing, organizing and using contacts in academic work. Let’s start with capturing. Several years ago I would collect business cards and type them into my Contacts (then Address Book) app. I don’t have time or patience for this any longer, save for very special and important contacts. A lot of my contacts are captured from e-mail using the native Mac integration between Apple Mail and Apple Contacts. Clicking on a little arrow next to the Sender’s name in an email header allows you to create a new contact with that email address, modify the existing contact or simply open the contact card. If the message contains an address or a telephone number that may be automatically added to the contact as well. 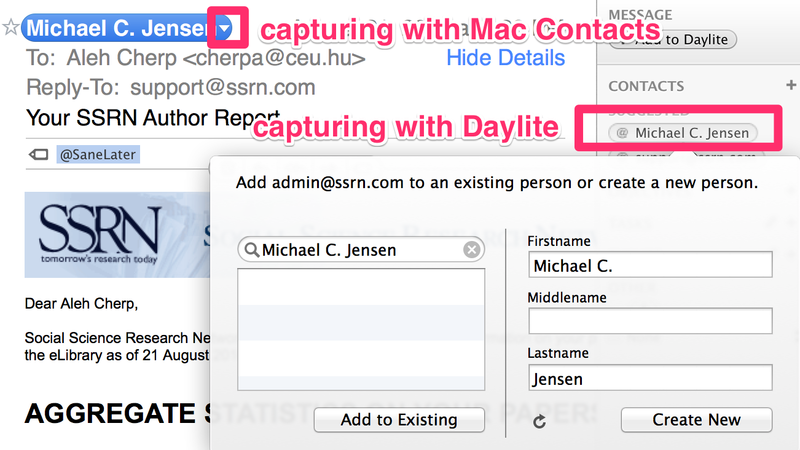 I also use Daylite Mail Assistant (DMA) to capture contacts from Mail directly to Daylite. (Daylite is a Customer Resource Management (CRM) and project management software designed for small businesses, which I am planning to cover in future posts). Because almost all my new contacts are professional and I try to keep all professional contacts in Daylite I actually use DMA more often than Apple native method. The second capturing method is through a wonderful app called Cobook. Cobook does many great things, but in terms of capturing it connects to your social networks (Facebook, LinkedIn, Twitter, Google + and others) and reads your contacts from there. It matches these contacts with the ones stored on your computer, in iCloud, Exchange Server, (and for me from Daylite). Then you can simply use the information from social networks to update your own contact database. Or simply use contact information in these networks to communicate with them with Cobook as a starting point. This is excellent because in a sense you have your contacts themselves filling in their data in your database! I have recently discovered the third great method of capturing contacts through Evernote. All you need to do is to photograph a business card through the Evernote mobile app. Evernote conducts OCR of the image and identifies name, email, telephone and other information. It then searches through your LinkedIn connections to match this information to your existing contacts. If a match is found Evernote adds a photo and other contact information from LinkedIn to the note. You can set Evernote mobile so that thus captured business cards are send directly to Contacts. Then, of course, the contacts are synchronized through iCloud back to your Mac. Evernote also stores the original scan of the business card with the contact. This method works very smoothly with English-language plain and legible font black and white business cards. On fancily colored cards with lots of graphic, logos and strange typefaces you may need to manually correct some information after taking the photo. I must add that I also tried to scan business cards through both Neat and Fujitsu scanners. Scanning with Neat worked a bit better, but still worse than photographing through Evernote. That’s all about capturing. I plan to have the next entries on organizing and using contacts. This entry was posted in Contacts and tagged Cobook, Daylite, Evernote. Bookmark the permalink. You may also try ABBYY BCR available for iPhone that works great for scanning and converting business cards. I use it extensively and it has good recognition quality for major European languages. It costs a couple of bucks I think.